Last year I couldn’t make the inaugural Endurancelife festival and it looked like it was great fun, so this year when I realised that I could do it, I was pretty chuffed. It is basically a weekend of different races with lectures in the evening all set in a field within the Flete estate on the South Devon coast. I had run along the coast here before so I knew how beautiful it was. 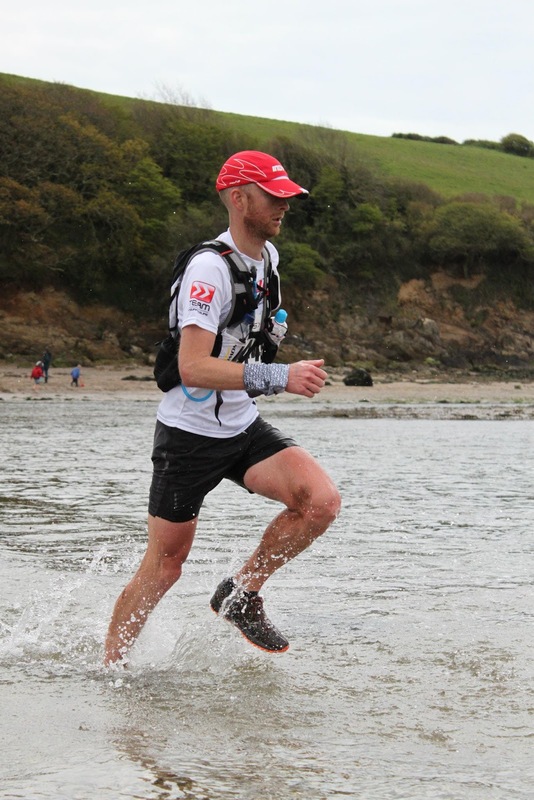 The races they had on this year were the now standard Coastal Trail Series which I of course entered, an adventure race and an intriguing new format titled the Aqua Trail. This consisted of nine runs and nine swims with a total distance of around 10km. My swimming is poor with my strongest stroke being breast stroke. But my running is alright, and I thought it should be great fun. So that was that, I was booked into the Aqua Trail on the Saturday and the CTS ultra on the Sunday. Lou was going to do the half marathon on the Sunday too. For evening entertainment, we would go to the lectures in the main tepee tent. The weather during the week hadn’t been too encouraging for a weekend of camping, but it would take more than that to stop us. We had another hire car again, so it was straight from work on the Friday down the M5 into Gods country (Devon). After a pleasantly uneventful couple of hours, we were winding our way down some country lanes heading towards the coast. We then saw an event sign that guided us into to the field that would be our home for the next three nights. It was a beautiful evening and the sights and surroundings were also lovely. This was going to be a relaxing weekend that’s for sure! Well, minus the 7 or so hours of intense exercise! We found a spot next to the shelter of the hedge and quickly set up camp. The sky looked very slightly as though it might rain down on us, but we were all cosy before it had a chance to dampen our welcoming. We had bought quite a bit of food so Lou begun cooking something for dinner. I will use this mention of food to just say that I am experimenting a little with my diet. There is no great science about my methodology, but generally I am trying to cut carbohydrates from my life. A few carbs sneak in, but the general rules are, no bread, rice, pasta, fruit, cereal, sugar and only enough milk for hot drinks. My diet now basically consists of cheese, nuts, meat, lots of veg, full fat yogurt and tonnes of peanut butter. Why am I doing this? Well, for a while now I have been training on empty for up to 4 hours. I want my body to be more economical and use the fat stores more readily. I know it is doing this, but I wanted to take it one step further and try to understand how far I can go with barely any carbs, and so begun the diet. I had attempted to run the Fellsman the week before carbless, but was weak willed when faced with the delights on the tables at the cp’s. This is not about weight management, this is about fuel management. We all have plenty of fat in our bodies that we can survive on for a great deal of time if we can just utilise it, and the level that I mostly work at is pretty low so the need for glycogen is minimal. As I said, it’s an experiment where I would like to learn a little more about the limitations of my body and how efficient it is. Ultrarunning is just one big experiment! The meal that Lou cooked that night was just great. All the better for being in a tent in a field. The night was a bit chilly and we both woke up early to some rain. As the morning progressed so the field got busier and busier. A few food places had set up that looked like they would be worth sampling post race. There was also a guy setting up a few racks of used swim wetsuits from 2XU. Once he was set up I wanted to be near the front of the cue. The Aqua Trail being a new format of event had no specific equipment, so Endurancelife had experimented a little and come to the conclusion that the best setup would be some trail shoes that drain really well as they would have to be worn during the swim, and a swim wetsuit cut off at the legs and arms. That is why 2XU was here with lots of damaged wetsuits. I was going to buy one then cut off the arms. It didn’t take long to find my size and I was soon hacking off the legs. I decided that I may as well leave the arms on. The race was not till around 1530so we had lots of time to chill and take in the atmosphere. The adventure race was going on at this time so every now and then you would see a team tiredly running through the main arena on the way to their next cp. Very entertaining! We bumped into James Adams, Ian Corless and Niandi Carmont and chatted. I also bumped into a few of the Endurancelife crew who were being kept pretty busy with the events and organisation that were continually going on. I felt pretty relaxed. 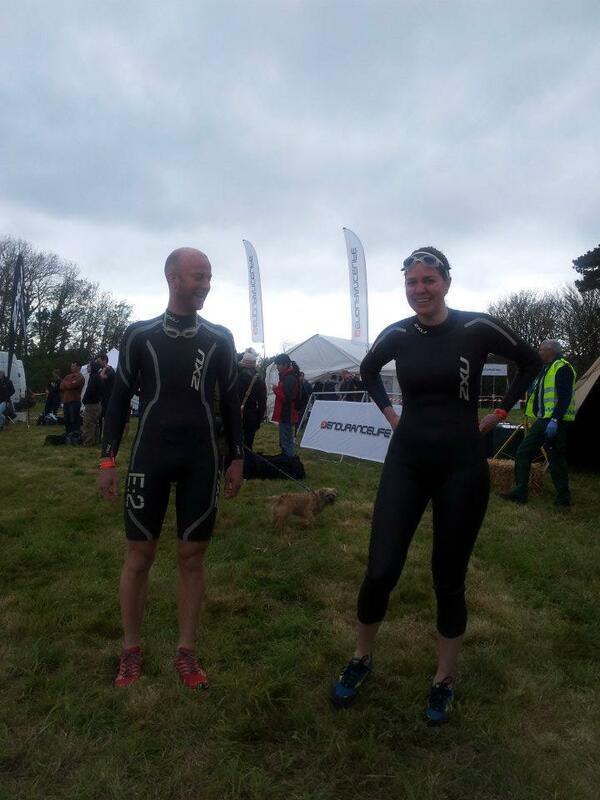 It soon though was time to get ready for the race, so I put a blister patch over the open wound that remained from the Felsman blister, pulled on my butchered wetsuit, my Inov-8’s and wandered over to the crowd of wetsuit wearers that was gathering in the corner. After a briefing from the crew, we walked the 10-minute walk down to the beach where the fun and games would begin. A few people went for a quick swim to get used to the water temp. I was already a bit chilly, but knew it made sense so jumped in myself. Bloody hell it was cold! I surfed a bit in my teen years and would stay in for hours all through the winter so thought I’d be alright, but I guess that was a fair few years ago now. My hands immediately begun to go numb. The course was three laps consisting of three swims each. The first swim was relatively short out to a buoy and back, followed by a hilly short run to the longest of the three swims across the estuary which was around 500 metres. Then a short hilly run again followed by the shortest swim back across the estuary. Then was the longest run where I could take some time back on the swimmers before returning back at the beach to complete the first lap and starting out for the buoy again. The race begun, and thankfully my experience of the Ironman I completed a few years ago had prepared me well for the madness that is the bunch swim! The madness of it all took away a little of the shock of the freezing cold water, not much though! I was not alone with my breast stroke, though there weren’t many others. The advantage of doing breast stroke in a bunch is that you can see where you are going and can push people away doing crawl who are crashing into you. Carefully of course. As I turned at the buoy, things had spaced out enough to have my own space, and I now found something that resembles a smooth stroke. Soon I was out of the water and running across the beach then climbing the steep steps around the coast line. I overtook plenty of people here. Before I could find any stride, I found myself diving back into the cold water of the estuary. This was the longer swim, so I just concentrated on getting a decent stroke going and reaching the distant bank as soon as possible. After around 10 mins(?) I crawled out at the other side, dibbed in then ran off up the hill. My feet were freezing and the x-talons I was wearing have very gnarly tread and are really light, so the road I was now running on was really quite painful. Fortunately my feet were so cold that they were a little anesthetised. After a quick off road drop back down to the bank, I was back in again for the shortest swim. The current here was pretty strong so I found myself adjusting my angle a lot to make sure I reached the right part of the small beach opposite. Once out, puffing and panting It was across a little bit of beach before starting a small but sharp climb. This was the longest run, so I had a chance to find something like a rhythm and overtook a few more people. There was more painful tarmac, before a final slight downhill trail to the beach that signified the end of lap one and the start of lap two. I knew this would be full on and it was living up to it’s expectations. As usual, I was going full bore too. The competitive animal was alive and kicking. I’m not sure whether this is the need to beat others (this is of course fun) or the need to perform at my limits. I tend to think it’s the latter as I get the same kick when alone and not racing. The field for lap two was nicely spread out now, and I guessed that I was somewhere in the top 20 (140 odd field) so was happy to just retain that positioning and enjoy the rest of it. As there was more space, it gave me more chance to concentrate on my stroke and my pacing on the runs. There was one chap that I kept getting thrashed by on the swims, who I would easily pass on the runs. I eventually got such an advantage on the swims that I lost him. Then as I gratefully begun my final lap another chap glided past me with apparent ease in the first swim. As we got out, I passed him on the run, but only just. This time my running couldn’t make up for my poor swimming and he eventually dropped me. As I dragged myself out of the final swim, I focused on getting every last drop of energy out before the finish. The final run was probably the longest and was pretty much all up hill. My favourite! I was pretty drained as I slowly ran up the track. I soon recognised the field that the festival and finish were based in. Then I saw the chap up ahead. I accelerated as much as my lactic acid filled limbs would allow before realising that it was all too late as he turned off the trail into the finish area. Soon after, I too crossed the line. I was cold and exhausted. I had finished in just under two hours and in 11th place! Awesome! I was really chuffed considering my lame swimming. I really enjoyed the event. A definite success in my eyes. I’m not sure I’ve found my new sport, but I think there is certainly a place for it. I would do it again if I was in the area. I didn’t hang around too long as I needed to get dried off and into some warm cosy clothes. I noticed that the blister patch hadn’t moved through all the soakings and beating I had given it so the wound below was in the same state as before. Result! Nice one Compeed! We had another fantastic camp stove dinner before popping over to the tepee for some fascinating and inspiring lectures before calling it a night. Tomorrow was the ultra. I couldn’t wait! It was a new course for me so this made it all the more exciting. Let’s see what the weather would hold for us. I arose early and naturally. I hadn’t slept great, but was eager to get running. I still could feel a slight soreness in my quads and the blister was still awkward from the Fellsman. I wasn’t expecting any great performances today! I had a breakfast of poached eggs in chopped tomatoes before walking across the field to register and collect my number and dibber. What a difference it makes to not have to travel on the morning of the race. Usually I would be waking at the crack of dawn and driving for a few hours to a destination that is not always the simplest to find, and often ends with me just about making it on time and being in a bit of a mad rush. There was the time of course where I was over 20 minutes late for the start and so started all alone. It was fun to pick my way through the field, but my pacing was all over the place as I tried to control my emotions and the fast flow of adrenalin. It was the same sort of feeling as when you go the wrong way then turn back and will accelerate to try to make up on the lost time, slowing soon afterwards, exhausted as you realise what has happened. So after having a nice relaxing time back at the tent, slowly getting ready, I realised that people were gathering for the briefing. I checked my watch. Even being right on top of it, I’m almost late! I speed up my preparations and wander towards the growing group. I make my way through the crowd and see a few EL team shirts. James Adams turns up a little after me and so does Oli Sinclair. Oli points out a chap and says that I shouldn’t chase him. His name is Mark Steinle and he was at the Melbourne Olympics apparently as the nation top marathon runner of the time with a PB of 2:09! Sage words from Oli, though even if I tried to stay with someone of that calibre, it would surely only last a few minutes! After the briefing we all gather around the first dibber point. This is not a mass start as you dib out to begin, so everyone gets strung out straightaway which is great when you hit single track. I start off close to the front and immediately we are running at a fair pace down a wide path. The pace is a little too quick, but experience tells me that soon people will slip into their ‘proper’ pace and things will spread out fast. It’s good to get out onto the coast path. The weather is glorious. In fact this is going to be a day where hydration will be paramount to a decent performance. As usual, I start out not feeling competitive, and within minutes I am happily working as hard as is possible looking for a result. I love to do well position-wise in a race (anyone who says otherwise is surely lying), but my real race is against myself. I am happiest if I finish, and am content with my performance, my pacing, nutrition etc. The whole experience completely revolves around the enjoyment factor. I only run as it makes me happy and gives me joy. It’s not all enjoyable, but conversely that adds to the enjoyment. The highs are exaggerated by the lows. A spread out group of us approached a gate. A sign pointed us inland. We ran up a long grassy field before seeing Mark Steinle ahead looking lost. Great, wrong way! We all dashed down the hill back towards the sign then went through the gate following runners who were behind and had learnt from our blunder. I watched ahead to see Mark passing the now front runners with apparent ease and incredible speed. You could see that his style was incredibly economical. He didn’t seem to be putting in a burst of speed to get back to the front, he just ran really quick! He’ll be showered and fed by the time I finish! Shortly after this, I again went slightly wrong meaning I had a very steep little climb to scramble up to rejoin the path. Never mind. At least I was doing it all at the start of the race. Can be difficult to deal with mentally in the latter stages when you’re tired. My back was drenched with sweat already so begun to drink plenty. It was humid and I really could feel it. As I slipped into my rhythm as I was almost alone, I could feel that as expected, I wasn’t firing on all cylinders. This was going to be a long hard slog. I would just take inspiration from the beautiful scenery and run hard. As we left the coast and went inland (the correct way!) I was feeling pretty sluggish and was just grinding it out step by step. After a lane that was pretty fast and a little technical, I passed through a dibber point and rushed on towards another lane. This one was very different though as it was flat and it was really wet and muddy. I wasn’t too keen on getting soaked feet here so was prancing around a bit. I am not too fussy about wet feet but if it isn’t too much bother then I will dodge the puddles to a certain degree to hopefully prevent blisters. Soon I was running through fields and staying vigilant to hopefully not miss the signs and go wrong again. It was laborious but I had battled to find some sort of momentum. The sky was blue and all was good in the world. Must keep drinking. I certainly hadn’t drunk enough considering the sweat levels. We passed up and around the estuary before heading out on the marathon loop. I wasn’t getting sighting of other runners now. I was alone and could now treat it as a solo run. I was happy and felt fortunate to just be in such a position. It was absolutely beautiful and I was doing what I love. I battled on trying just to hold my slightly weak pace. Soon, just before I returned to the coast path to head back towards Flete, I saw a runner ahead. I tried to not get excited and not accelerate. Within five minutes I had caught him. We ran together for a while. He had run the Oner a few weeks ago and had got a decent result despite getting pretty lost. We were running a lot of flat and downhill together, but as soon as we hit a hill I started to power walk and left him. I made myself drink at the top before starting the long run down through the golf course back down to the coast. The route now took us along the flat beach instead off up a vicious uphill. The beach wasn’t smooth sailing though as my feet were sinking a little in the sand which was energy sapping. I would have preferred the climb I think! After a mile or so I left the beach, grabbed a handful of jelly babies at a cp and ran off through a car-park which I remembered from when I ran the Trailblaze down here. Familiarity is not always good, but this was good now. I certainly felt as though I was in more of a peak than a trough at this moment. And as I always believe, you should always take advantage of the peaks and give a little more. I knew that it wouldn’t last too long so I may as well enjoy it! I passed through a little village before heading up a tough little climb that made me sweat more still reminding me to drink. After a tough little downhill that was really testing my poor sore quads, it was straight into a really tough very steep climb. The sort of steep that feels like you’re going to snap something! Halfway up there was a perfectly positioned sign from Endurancelife reminding you to “Never, never, never give up”. I remembered this from before so knew what to expect. I was looking forward to the end of the marathon loop as we had to cross the estuary which would mean a little bit of paddling! I was soon taking a familiar turn in a field. Here was the estuary! A quick drop down before a climb then it was on a really fun bit of single track through some beautiful woodland that spat me out all too soon where I now joined the trail with runners doing one of the shorter races. I followed the masses down onto the sand and then ran full bore into the 50 metres or so of water at low tide that needed to be crossed. I swung my feet out to the side to prevent them from dragging in the water so much and noticed there was an ultra runner on the opposite bank putting his socks and shoes back on after obviously not wanting to get them wet. I didn’t care at this stage in the race, I escaped the drag of the water and left him sat there struggling with his footwear. Before leaving the sand the was another smaller flow of water to run through. The guy behind would surely run straight through this one! What a waste of time keeping dry initially! It was now straight back out for the first loop we did. I was pretty wrecked but still keeping some momentum with the knowledge that the majority was done now and that the remainder was still pretty fresh in my minds eye. I guessed that I was in 5th place. If I could hold that I’d be pretty chuffed, but I felt like this was going to get pretty messy! I was dehydrated again! What an idiot! Oh well one day I will hopefully learn! I have realised that my weakness is running in the heat. Well, to be more specific, I just don’t drink enough! So stupid, but for some reason, I don’t seem to be learning after all the lessons I’ve dished out to myself. I really was just hanging on now. Although this is not a great state to be in, there is something that excites me about this. Maybe it is that I am really up against the wall not only physically but also mentally. Subconsciously my mind is trying to slow me down and the true challenge is to override that ever growing power. I kept looking behind for the chap who took his shoes off, but the elastic had snapped. He was dropping back, so obviously was struggling more than me. That was good for morale and enthused me to push on till the end. I left the coast and was dropping down the lane. I promised myself I would stop at the cp at the bottom and drink plenty of water and take a large handful of jelly babies which I did. It was here that Olly flew past with apparent ease. I was not in any state to be chasing people so just continued with my laboured run. Steady effort was critical now to my performance. Short bursts of acceleration would do me no favours! Next it was into the lane full of puddles. I was not willing to waste energy hopping around the puddles and the facts that there wasn’t far to go and my feet got completely soaked through in the water crossing, made it all the more pointless. This in fact made it a really fun, liberating experience, bounding through the deep muddy puddles with the joy of a child. I generally find that the most fun gained from running are situations that remind you of my childhood. Running out of control downhill, through muddy trails, hopping from rock to rock, these are all things that bring so much simple joy to my life and a stupid grin to my face! The pain soon returned when the puddles disappeared, but I was closing in to the finish now. I must keep my feet moving quickly. I like to try and concentrate on my style at these times. The focus on my landing, stride length, being relaxed etc, helps to pass time and takes your mind off of the pain. Sure enough I soon got to a sign that was pointing the ultra race towards the finish. There was some steady uphill which I walked some of, before turning up a familiar path. Familiar as I’d ran up it yesterday during the Aqua Trail towards the finish. I knew I only had a few minutes left. I now went as hard as I could, which I have to say was pretty lame, but as I turned into the field and crossed the line dibbing in for the final time, my read out gave me the surprising news that I had come third! I’m not sure how that happened but needless to say I was totally content with that result seeing as I had such a struggle out there! The rest of the festival was great and the talks that night at the live more lectures were again, inspiring and remarkable. I slept well that night. Overall the festival was an incredibly fun and relaxing weekend. There were just the right amount of people there for it to work without it being to big. I’ll definitely be attending next year! The week that followed was to be my now standard rest, as I was going down to the South Downs Way again to give that another bash. This time I would complete the journey to Winchester. I would not be doing it alone, or with Lou, but with James Elson who wanted to run the whole thing without the pressures that a race brings.